The Houston Rockets in collaboration with the US Department of Defense partnered with Santa Maria to paint some of the bedrooms and offices at the Jacquelyn House. Volunteers from Palais Royal help us maintain the non-transactional store fully stocked and organized so that our clients can fulfill their basic clothing needs. Dozens of Volunteers from the Houston Texans, Palais Royal and United Way visit Santa Maria for a Day of Caring and helped to take care of our outdoor areas. Volunteers from Enable Midstream Partners worked on the outdoor garden at Jacquelyn House and left it looking real pretty. Exxon Mobil volunteers help us paint about 175 yards of the fence at Bonita House. With more than 1,300 people providing in excess of 10,000 hours of service each year, Santa Maria volunteers offer their time and talents for the betterment of the clients and our facilities. We cannot thank them enough for their hard work, dedication and compassion to make a difference. If you or your group would like to volunteer, we welcome the opportunity. Please see below for opportunities and to download the Volunteer Application. Thank you. 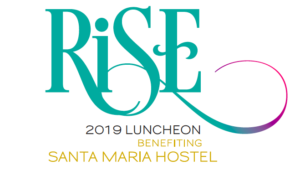 Please contact Director of Community Engagement, Cynthia Turner cturner@santamariahostel.org for more information. This is a great way to get your co-workers, friends and/or family together and make a big impact on the women and children while having a rewarding experience to share. Projects can range anywhere from light construction renovations such as installing new windows or painting to creating play areas for the children and landscaping. There are also opportunities for interactive events and activities with the clients of Santa Maria such as: arts and crafts, holiday parties, carnivals and much more. Would you be interested in spending a few hours, once a week, rocking, holding and cuddling babies? Throughout the 90-day intensive rehab program, the moms are required to spend 30 hours in class/group. We need volunteers willing to come in and give them a hand. If any church programs are interested in hosting a retreat for our women, day camp for children or family group on a Friday evening or Saturday. Meditation, prayer, speakers and / or crafts are possible objectives for these retreats. The mission is to give a brief reprieve in which clients can enjoy and reflect on the purpose of living a substance free life. KIT is a program for children separated from their moms by drug rehab or custody and suffer strong feelings of abandonment. This is only made worse when they don’t get mail from their mom. The KIT program provides mothers the tools for them to communicate, on no less than a monthly basis through cards, postage, assistance with addresses and writing. Family nights are special times each week when the families of the Santa Maria Hostel women are invited to come to our facilities and attend group educational sessions. Unfortunately, some families are either unwilling or unable to participate, leaving these women with no family support system while they are in treatment. Would you be willing to stand in the gap one evening per week and be there for those women throughout their stay at Santa Maria Hostel? As the women of Santa Maria progress in their pursuit of recovery, they learn just how many everyday skills they have either lost or never had. In order to address this deficit, volunteers may offer special learning sessions designed to teach our clients how to balance their checkbooks, plan nutritious meals, shop prudently, organize important papers and files and how to manage many other aspects of their daily living. An important component of a woman’s recovery is learning that she is not alone. Our women have found that spirituality groups make such a difference in helping them to accept the need for support from others, to reach out to others, and to establish a relationship with a “Higher Power” of their choosing. If you have experience and knowledge of 12-step recovery and spirituality, our clients could benefit from your experience. There are so many aspects of providing treatment and the clerical duties associated with this wonderful opportunity are numerous. Your clerical skills would be a great asset to the administrative offices, our program directors and our medical records team at all sites. Many of the children of our clients experience academic difficulties. Would you be interested in assisting a client’s child with their homework or helping them to learn their multiplication tables? Your help is needed at our Parker Road site to assist these children in the learning process and remove one more concern from an already over-burdened mother. The renovation project was valued at over $300,000 and included a generous amount of donated materials and volunteer time. Volunteers participated in refurbishing the dining room and two group counseling rooms. They also landscaped the outdoor green space and playground area and installed new playground equipment and a shade sail.